My Mom usually had command of the kitchen. 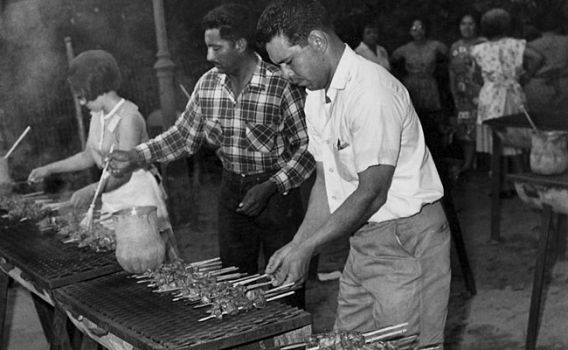 But when it came time to grill outdoors, it was 100% Dad. 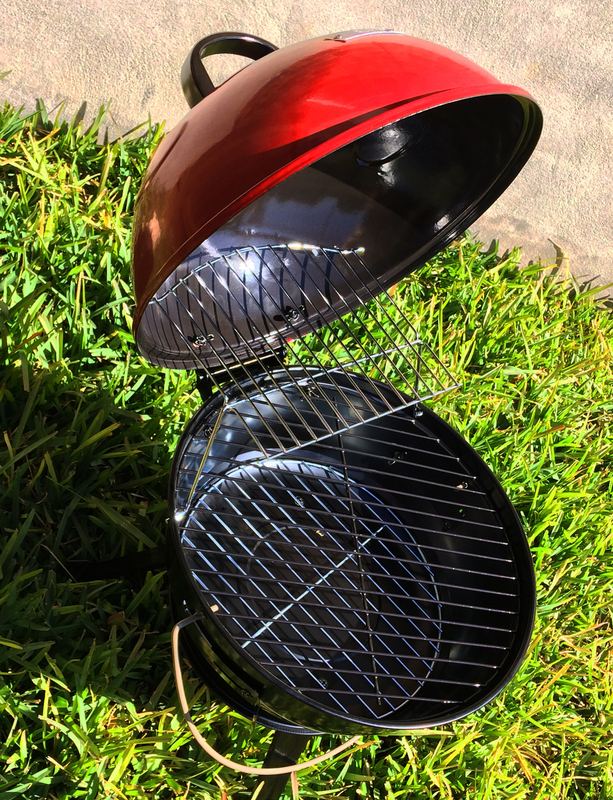 Growing up, our brick-walled patio featured a corner grill – something I’m pretty sure was considered a little ahead of its time in the 1960s, when our house was rebuilt. Dad always cooked on charcoal. 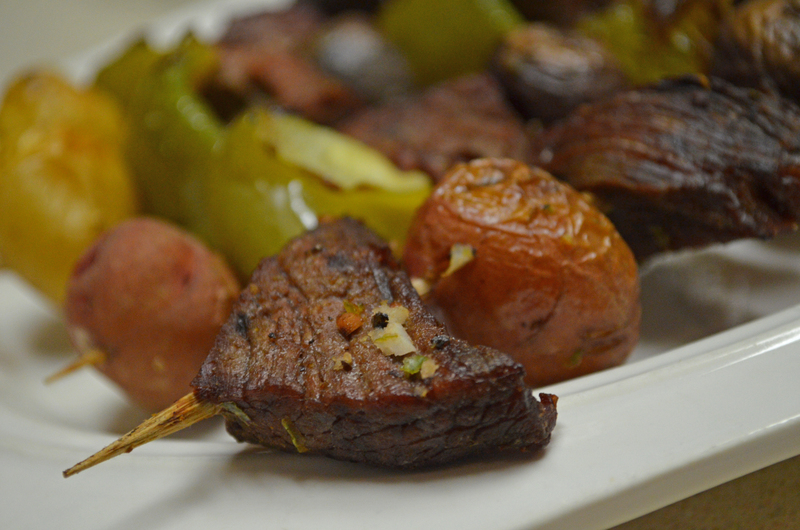 “Anticuchos” is a bit of a tongue twister, but if you’re a San Antonio native like I am you likely know anticuchos from the annual NIOSA festival where in just 4 nights more than 18,000 anticuchos are sold to festival goers who salivate for this sensationally savory shish kabob dish. You can read more about NIOSA at my Sauerkrat Bend’s Potato Salad Recipe here. Anticuchos are a uniquely Peruivan dish typically made of beef hearts and grill-basted with a fiery marinade of vinegar and a peppery paste. More modern versions of the dish have expanded to be made from chicken, beef liver and my favorite – beef tenderloin, like Mom’s recipe here. ❤ This dish is easy to make but it does require letting the beef marinate overnight … so give yourself some prep-ahead-time. Your tastebuds will thank you later. ❤ You can make anticuchos with just the meat or alternate the skewers with meat, bell peppers and new potatoes – this is how my family made them at home. I remember my Mom and Dad using green bell peppers but adding red, yellow and green only makes the dish more colorful. ❤ Two gifts in one! You only use the bacon drippings (not the bacon) so you can enjoy a bacon snack while you’re outside grilling or save the bacon for another recipe. Hint: nobody saves bacon, so better eat it up before I beat you to it! ❤ Love living life in the spicy lane? My Cousin Julie says she enjoys her anticuchos marinated with Pickapeppa Hot Pepper Sauce. 1. 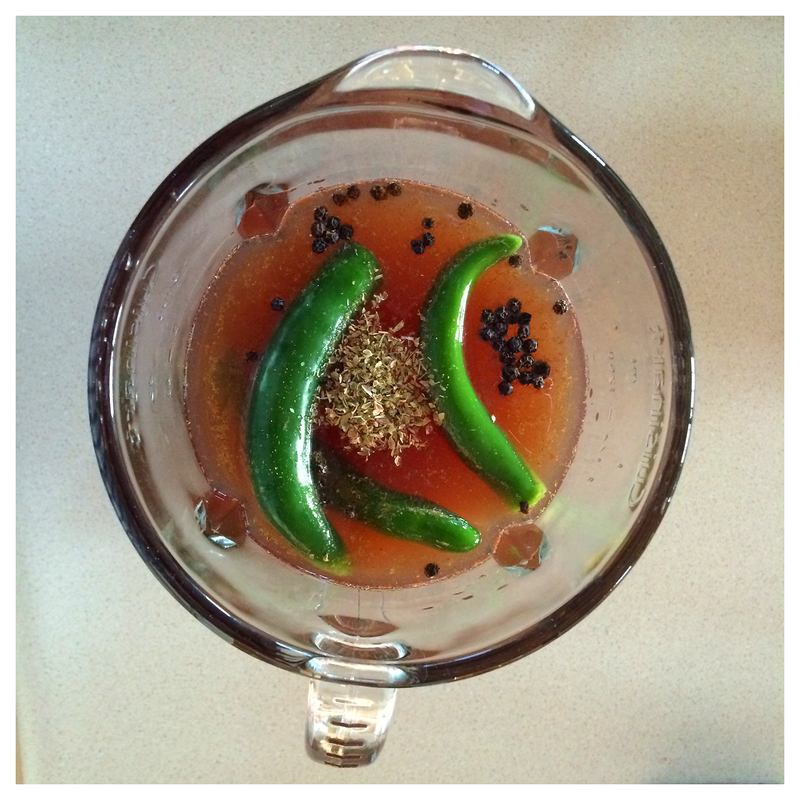 Combine the first 8 ingredients for the marinade in a blender and blend thoroughly. I couldn’t get my peppercorns to crack (probably because I have a lower-end blender) but they will add some flavor to the marinade nonetheless. 2. 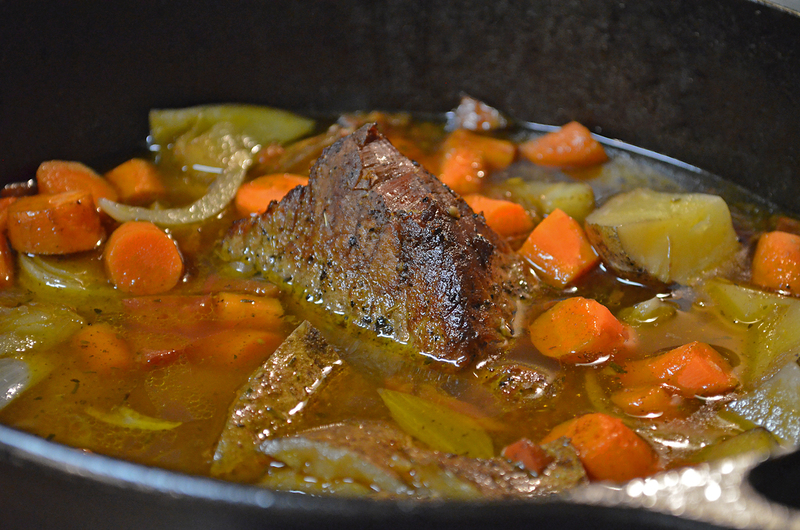 Place the cubed beef in a glass dish and cover with the marinade. Marinate several hours or overnight (overnight highly suggested)! 3. 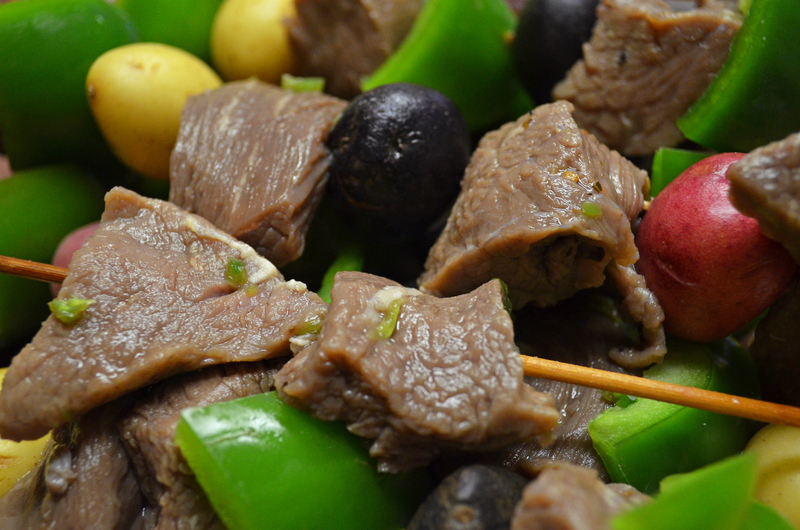 Spear the marinated cubed beef with the prepared skewers – and if adding the optional peppers and new potatoes (which is what I did) – alternate the ingredients on the skewers. 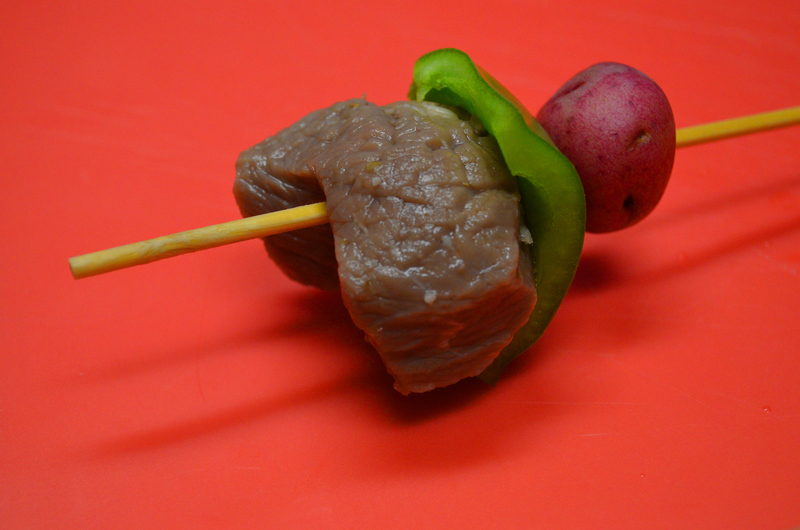 Continue skewer-ing until you’re all out of ingredients. 4. Add the bacon drippings (to taste) to the remaining marinade then baste the meat while cooking over hot coals until you’re ready to remove them and enjoy. The bacon drippings add flavor and make the meat smoke. Delicious! 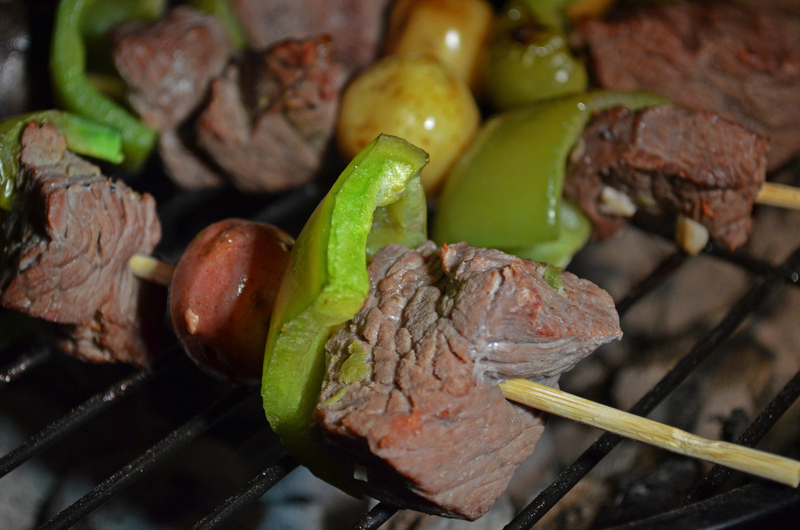 Yield: 8-12 skewers of tasty meat and veggies! 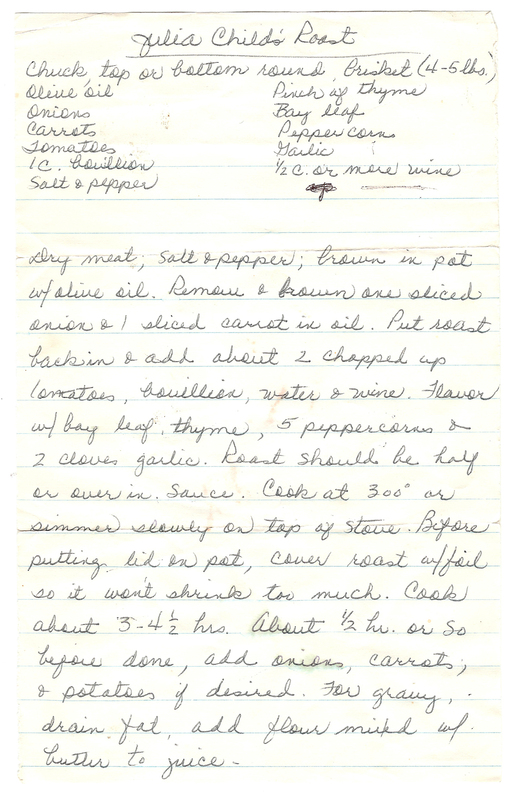 Here’s a scan of the original recipe as penned by my Mom, Betty! Sometime’s life and eventful timing collide. 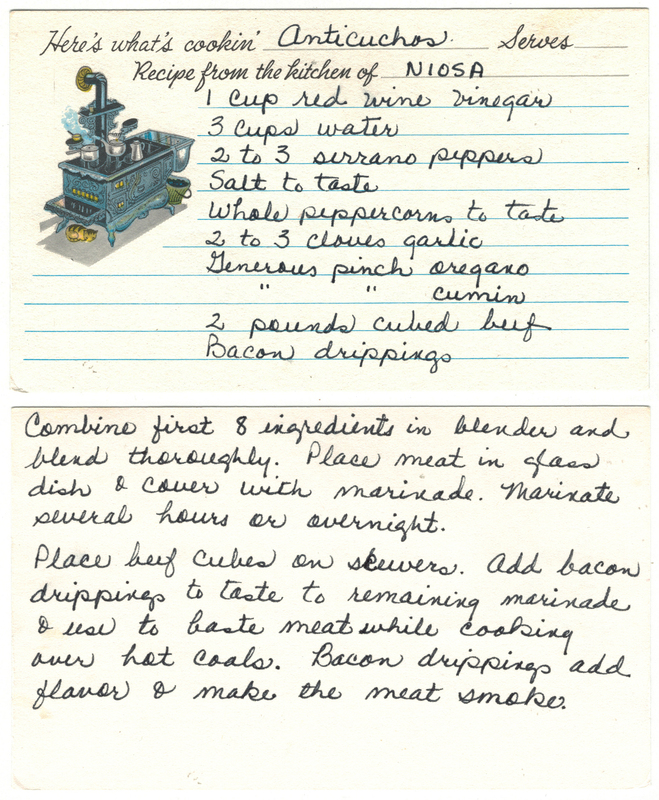 This week we just so happened to randomly select this recipe from many in Mom’s cookbook. After further research … How did we know it was Julia Child’s birthday (August 15th)? And who eats a savory hot roast in summer? Apparently we do! This recipe requires a little TLC in the kitchen and I think it’s well worth it – the results speak for themselves. Hats off to you, Julia, for inspiring the joy of cooking in so many people – including my Mom! And thanks for channeling us to find this recipe. A little taste of the good times. ♥ The sauce below sounds nice. We made it but didn’t think it was necessary; this roast is delicious as is without added layers of flavor and texture. ♥ By “1/2 cup or more of wine” below, we suggest or more to “keep it real,” as they say. See what you think. 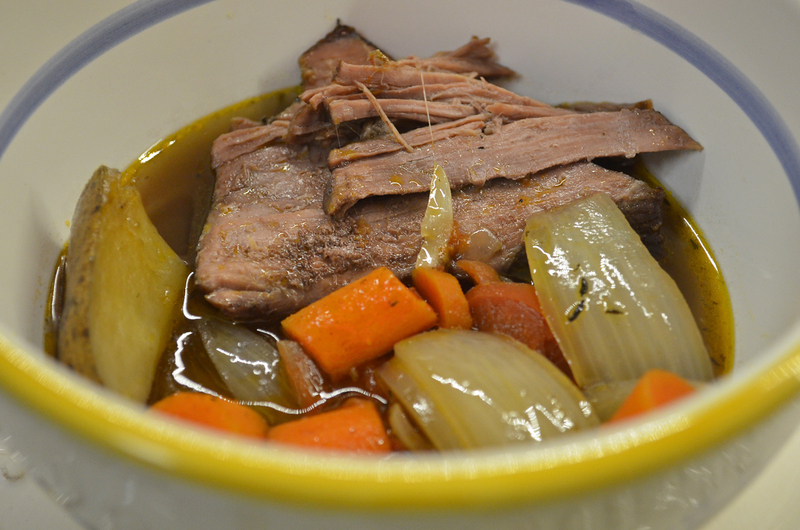 ♥ If you love stews try this Tuscan Beef Stew recipe. This dish makes regular appearances at my table and guests love it. 1. Dry the meat – pat it with a few papertowels. Cover it with salt and pepper. Brown it in a pot lined with a coating of olive oil over medium heat. Remove the meat from the pot and set it aside on a plate or on a piece of foil that we will use later (below). 2. Brown sliced onions and sliced carrots in oil. Put the roast back in the pot and add chopped tomatoes, bouillion, water and wine. Flavor with bay leaf, thyme, peppercorns and the garlic cloves. Half or more of the roast should be covered in sauce; add water or wine if necessary. Before putting the lid on the pot, cover the roast with foil so it won’t shrink too much. 3. Cook at 300°F or simmer on top of stove 3 – 4.5 hours. About 1/2 hour or so before the roast is done, add onions, carrots, and potatoes if desired. 4. For gravy: drain the fat off the roast juice. Add flour mixed with butter to juice.